Larry Levy is Chairman and Chief Executive Officer of his real estate development company, The Levy Organization, which he founded in 1978. Larry’s vision for real estate has guided major real estate projects in the last three decades. Larry has been a partner in more than 50 office, industrial, hotel and residential real estate acquisitions in multiple US cities, the Caribbean and Mexico including: One Magnificent Mile, Chicago Mercantile Exchange Center, One South Dearborn (partnered with Hines), Woodfield Lake Office Campus, Waterfall Glen Office Park and the Butterfield Center for Business. The Levy Organization is also a partner with Hines in the development of River Point, an office development on the Chicago River at Lake and Canal Streets, as well as large developments in Denver and Miami. Larry is also Chairman and Founder of Levy Restaurants, a large food service company with restaurants and sports entertainment venues. Larry is also Chairman and Founder of Levy Restaurants, a large food service company with restaurants and sports entertainment venues. 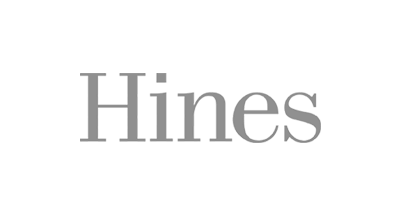 Hines is a privately owned real estate firm involved in real estate investment, development and property management worldwide. The firm’s historical and current portfolio of projects that are underway, completed, acquired and managed for third parties includes 1,273 properties representing more than 514 million square feet of office, residential, mixed-use, industrial, hotel, medical and sports facilities, as well as large, master-planned communities and land developments. Currently, Hines manages 406 properties totaling 148.5 million square feet, which includes 78.3 million square feet for third parties. With offices in 113 cities in 18 countries, and controlled assets valued at approximately $24.3 billion, Hines is one of the largest real estate organizations in the world. Hines is also a world leader in sustainable real estate strategies, with extensive experience in LEED®, ENERGY STAR®, BREEAM, Haute Qualité Environnementale and DGNB green building rating systems. Hines approaches property and facility management from an owner's perspective, delivering unparalleled service, asset management, energy efficiency and the reduction of real estate investment risk. Properties managed by Hines outperform their competition time and time again, with a better caliber tenant, higher rents, consistently superior tenant satisfaction ratings and extraordinarily high retention rates. It’s understandable then that the company is recognized as a leader by various management and energy-efficiency benchmarks worldwide. Hines has the skill and knowledge to evaluate a property and create just the right strategy to maximize its value. Hines offers a full range of services to corporate and institutional real estate owners: asset management, property management, marketing & leasing, development & redevelopment, acquisition & disposition, finance & accounting and engineering. The firm works closely with every client to identify current needs and create innovative solutions to reach short- and long-term investment goals. By combining an owner's goals and objectives with property management expertise, Hines adds value to real estate across the globe. The firm brings a half-century's experience and a depth of knowledge to all its management clients. A leader in the EPA's ENERGY STAR program, Hines has 175 managed properties that have earned the ENERGY STAR label. Another 12 Hines projects have been designated as Designed to Earn the ENERGY STAR. Hines professionals participate in the development of cost-effective "green building" initiatives. The Hines senior management is the most tenured in the industry, averaging more than 23 years of service with the company. The Hines organization brings depth of knowledge and expertise to all its services including real estate and market assessments, marketing and leasing, construction management, energy management, security, asbestos abatement, project accounting, project redevelopment and new building commissioning. Experience - Hines has over 137 million square feet under management. Maximized rental rates through a combination of controlled operating expenses and superior service. High occupancy rates - Hines managers work hand-in-hand with leasing teams to maximize property occupancy. Attractive insurance rates - Our outstanding casualty claims history permits Hines-managed properties unusually attractive insurance rates. Trained, experienced managers and staff, in appropriate numbers, are committed on-site to each project. Crisis management - Hines has the depth and established procedures to respond to crises and minimize financial impact to owners and tenants. Parking management offers superior revenue management software.